We find loads of people around us; suffer from high blood pressure, mostly women during pregnancy. It’s a common issue these days, but you can control High blood pressure by reducing it in diet. 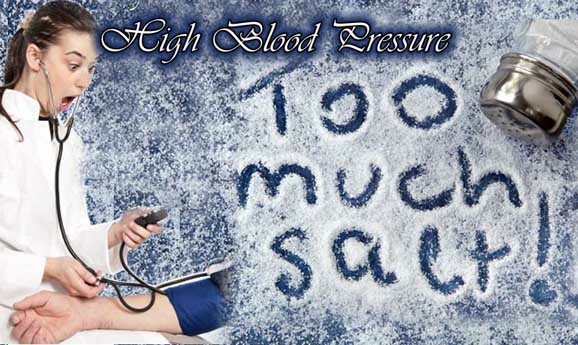 The salt is the main reason and plays a vital role to control High blood pressure. Yes! Of course, one of the main causes of high blood pressure is definitely the salt that we take every day in the form of meal. If we reduce its quantity in our every day meal, can get fruitful result to control High blood pressure. * Use meal that is made up with fresh ingredients rather than processed ones, if possible; in this way you can save yourself from thousand milligrams of sodium, circulate in your body for example, you can prepare soups and sauces at home. Try to use dried beans after soaking rather than opening a can of beans easily available in the market. Yes, it is a time of commitment with your health, if you are serious about reducing salt in your diet to control High blood pressure. * Choose foods wisely; if you definitely want or need, opt for frozen or canned vegetables, for reasons of shortage of time, look for shelf products with low or reduced sodium content to control High blood pressure. Before using, put the food in a strainer and rinse under running water. This will help you to eliminate some of the sodium content stored in them. Also, reduce or eliminate the extra salt that you are going to use during preparation meal, because canned food already contained some quantity of salt. Avoiding salt is a good trick to control High blood pressure for those suffering from it; it will help you stay healthy. * It is advisable to use a spoon when you add salt to your foods, to be sure that you are not exaggerating, even if the recipe demands for a “pinch” or “sufficient” quantity of salt, don’t follow the recipe; for example, add salt by using the tip of a teaspoon and taste, whether it is sufficient for the preparation or whether it should be added more. Often people use pinch to add salt in meal, avoid this habit to control High blood pressure. * Distract your palate aromas with edible acids such as lemon or vinegar, can help to bring out the inherent flavor of a food. This trick will surely help you to reduce or even eliminate the salt. Or, try adding some grated lemon zest, a sprinkle of chopped fresh or dried herbs. Although it’s not a perfect substitute of salt, but can help ease the transition to a low supply of salt particularly if you want to control High blood pressure. * Of course you need to enhance the flavor of the vegetables in your diet; many vegetables as they perceive tastes like bitter, people use excessive quantity of salt to counteract the flavor, instead of adding salt, try roasting or grilling such vegetables. These cooking techniques help to bring out their natural sweetness and give them a good look like caramel. Consequently, help to control high blood pressure.